Paper is a terrific, but sadly underutilized artistic medium. Even though it is big in Japan, around the world not as many people follow it as they should. Japanese paper art have a typical Japanese taste in it, but there are other artists around the world who are creating exceptional paper art in their own styles, and that’s where this art form reaches its true potential. And that true potential is what we are sharing today. This is a collection of 30 incredibly creative paper artworks that will aspire you to start working on your own. This article focuses on the weird and wonderful ways in which paper can be used to create stunning sculptures and implausible installations. Using everything from crepe paper to tar paper, dollar bills and even toilet rolls, you’ll be amazed by how a little cutting, sticking, folding and molding can transform paper from a boring, everyday substance into something a lot more special! This is an anime-inspired artistic discipline which involves drawing cartoon characters onto paper, cutting them out and inserting them into real life situations, making it look as though the characters have come to life. These four paper children are arguing over who gets the N64 controller. A sharp scalpel and an even sharper eye are needed for crafting a paper tree like the one above. The attention to detail is stunning-individual leaves are even visible. Here’s a piece of work that will change the way you look at toilet rolls forever. A zoo, complete with swinging monkeys and visitors has been crafted inside the inner, cardboard tube. This is a paper, aluminum and ink sculpture inspired by maps of crude oil and natural gas pipelines. Junior Jacquet folds and scrunches to make realistic faces out of – yes, you guessed it – toilet rolls. A room is transformed beyond recognition and all scale is lost as it’s covered in small sheets of paper. Yulia Brodskaya is one of the more widely recognised paper artists in this list, her work having been used in advertising and other commercial projects. She folds and rolls brightly coloured paper to create vibrant visual feasts. Michael Velliquette is an absolutely prolific artist who favors paper as his medium. The above work is a “cut paper collage” showing a wild riverside scene complete with animals. In addition to his “cut paper collages”, Velliquette specializes in “cut paper sculptures”. The image above shows a colorful example. In a similar vain to Paper Child, McKimens attempts to bring drawings to life in three dimensions by erecting seemingly hand-drawn sculptures, such as this clapped-out old truck. Matthew Rich uses latex paint, linen tape and cut paper to create the abstract shapes which define his work. Mia Pearlman has become famous for her wispy, cloud-like paper installations, such as Eye, which takes on another dimension thanks to the natural light coming from the window behind. When it comes to making sculptures of birds as beautiful as those of Anna Wili, not just any old paper will do. She uses archival cotton paper, along with cotton thread, brass rods, ink and watercolors to make works of art like Galah above. It turns out toilet roll art isn’t so unusual after all. Here, Brooklyn based master-craftsman, Yuken Teruya, has made lifelike plants from the inner tubes. Tar paper is a heavy-duty, tar impregnated substance used in the construction industry. It’s this material which Tara Donovan used to make her sculpture, Transplanted, shown here in the Ace Gallery in Los Angeles. Amongst other things, Michael Swaney makes sculptures from everyday household objects. This colourful sphere was sculpted from circles of hole-punched paper. The paper human above is but one character from a far larger paper landscape complete with weird and wonderful paper objects and people. Paper, glue and foam were all that was needed to build this magnificent, if not rather bendy, paper house. Mayuko Fujino cuts out paper shapes and rearranges them to create bizarre landscapes inhabited by anteaters and other animals. This piece is called “Buscando a la Serpiente”, which means “Chasing the Snake”, and you can see why. The paper has been expertly folded to form a thoroughly serpentine shape. It would be impossible, or at least unjust, to write an article about paper art without covering Jen Stark, an eminent paper artist whose energetic sculptures are second to none. Ian Wright took rather a literal approach to designing the front cover of T.I.’s album, Paper Trail, by constructing an image of the rapper’s face from real scraps of paper. The end result is breathtaking. Many have tried to imitate, but none have managed to replicate the quality of Brian Dettmer’s sculptures made from books. They really are a wonder to behold. 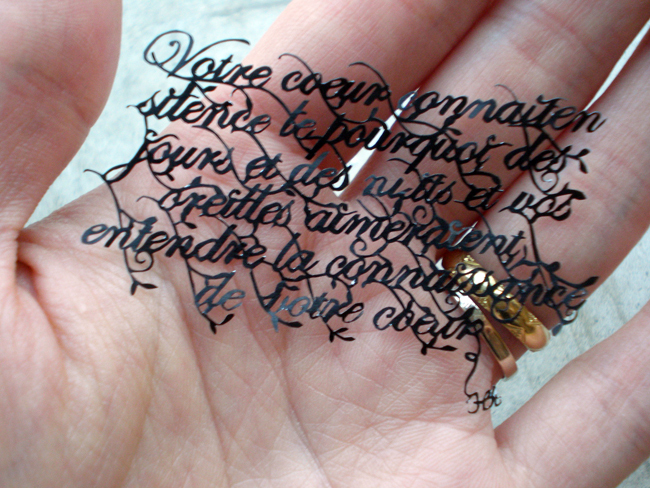 Hina Aoyama’s paper cut artworks are some of the most intricate in the world. Delicate and stunning, they stand as a testament to her incredible skills with a pair of scissors. 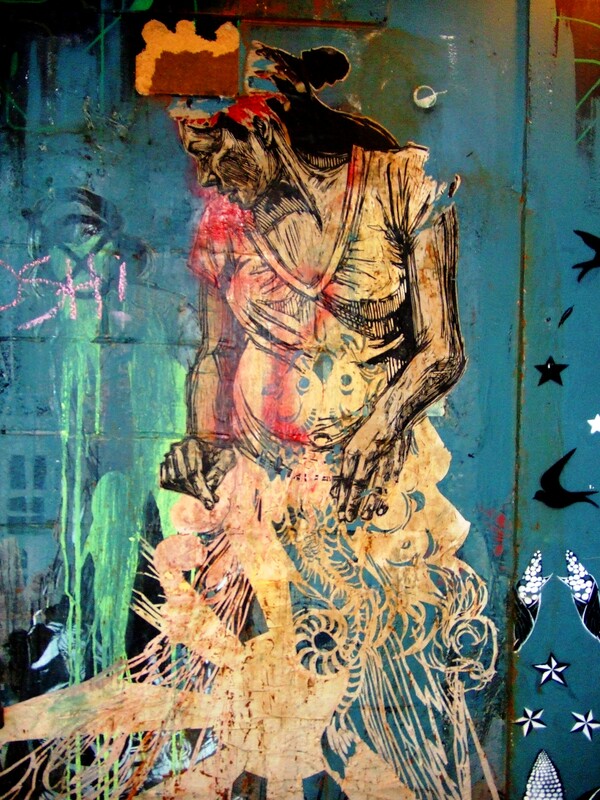 Swoon is a female street artist who uses cut out paper, rather than spray paint, to exhibit her work on the walls of America’s city streets. It’s unclear whether this piece was intended as a work of art or not, but the creativity involved in its manufacture is undeniable. Anna Lomax, one half of design duo, Jiggery Pokery, decided one day to brighten up her bedroom with paper and coloured pens. The result is quite incredible, turning a boring space into a living cartoon. So far we’ve limited our artistic quest to sculpture, but what about fashion? Take a look at this stunning dress made from the pages of a phone book. It’s not just high fashion, but street fashion which can be recreated in paper. Try these paper Nike sneakers on for size! Say “paper artwork” and most people instantly think of origami. I’ve tried to steer clear of the ancient Japanese art form in this article, thinking it too obvious, but an origami koi made from dollar bills could simply not be excluded. This post was written by James Adams, a passionate artist and designer.